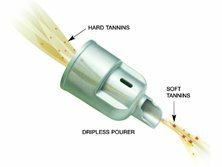 Soften your tannins with... magnets? What will they think of next? A California company, Inventive Technologies Inc., is marketing a pouring spout - the "BevWizard Wine Enhancer" - which they claim will take the edge off of rough, young, tannic wines. The $30 BevWizard apparently works using powerful magnets embedded into a plastic pouring spout which is inserted into the neck of a wine bottle. Only the wine that is poured through the BevWizard is "altered." The company claims that wines poured though the BevWizard are exposed to high-intensity magnetic fields that render the wine softer, fruitier, and seemingly more aged. (The company also has a disclaimer that the magnets in the device are extremely powerful and can affect pacemakers, credit cards, cell phones, TV's, etc.) There's an interesting article in the LA Times about this device, and its inventor- a California physician. I consulted with Norman Latner (my dad), who worked for over 40 years for the US Department of Energy as an electrical engineer, and is something of a magnet expert. I was hoping that he could debunk the idea that a magnetized pouring spout could affect the taste of wine, but although he had many concerns about the device, he felt that he's not enough of a wine connoisseur to debate the testimonials in the LA Times article. "This device flies in the face of common sense and scientific knowledge that a magnet would have an effect on tannins in wine," he said. And, despite the company mentioning that there is a patent on the device, there was no further information or patent number provided. "I would have been happier seeing a real reference to the patent," said Norman. The magnets used in the device, according to the company's website, are "Neodymium" magnets -- according to Norman, there is nothing special about "neodymium" magnets, except their size. They are the only magnets that would fit in a device so small, and are commonly used in things such as electric toothbrushes. Even if there were something special about the magnets, Norm went on to question whether the wine is actually in contact with them for long enough to make a difference. "It only takes a few seconds to pour several ounces of wine," he said. He also pointed out that similar products are being sold for the gas lines of cars, with claims that the magnets alter the large molecules of gasoline, allowing the car to run farther on a tank of gas. These claims, he pointed out, have been debunked by Consumer Reports and others. Could the BevWizard possibly work? Norm couldn't say conclusively that it couldn't, but he advised that a more sensible system would be a magnetic stirring wand with holes in it to create aeration of the wine. "A magnetic stirrer," he said "would be in contact with the wine for a longer period than a spout, and the holes would introduce oxygen into the wine." When I asked him to consider taking a patent out on this idea however, he declined. 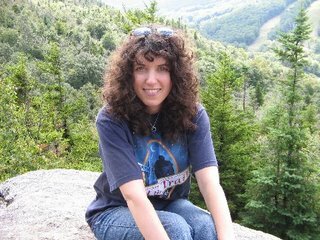 Thank you to Bruce B. for finding this article for me, and to my dad for his comments. In July, my husband Mark and I, and our friends Oona and Don will be in Sonoma, CA for a week of wine tasting and relaxation. Mark and I did a similar trip in 2001, and loved it. While I'm there, I hope to be able to update this blog and bring you information on some of the great Sonoma wineries. If you are considering a vacation, Sonoma is an excellent choice. Whether you are the outdoorsy type who wants to bike or hike, or the pampered sort who wants to hit the spas and have limo-driven wine tours, Sonoma has it all. For the literary type, a visit to Jack London's Beauty Ranch is sure to be enjoyable. In 2001, we saw Othello performed outdoors at a winery under the stars. This year, we will be seeing 12th Night at the Stevenot Winery. One of the things I liked best about planning this trip was how easy it was. I filled out one form on the Sonoma Visitors Bureau website, and was immediately flooded with information on lodging, places to eat, and events. Stay tuned for our adventures in Sonoma in July. This bottle, attractive though it is, is currently sitting on the kitchen counter and not a soul wants to touch it. I'll admit that this disappointing wine was purchased on the basis of it's pretty leaf-shaped label, and little else. So I suppose I got what I deserved. Malbec is one of the most important of the Argentinian red wines. 70% of all wine in Argentina is made in Mendoza, and the malbec grape is the most important of all grapes in Mendoza. While malbec is often blended with other grapes to make wine, the Argentinian malbec is able to stand on its own... except in this case apparently. This wine was a deep redish purple with a nose of strong alcohol mixed with berries. The taste was of bitter dark grapes and alcohol, with a sourish flavor. I suppose it's possible that I got a bad bottle, but it had a (gasp) plastic cork and I thought that manufactured corks were supposed to prevent a wine from turning. I won't rule out Argentinian malbec in the future, but I might try something that's been recommended, like Felipe Rutani or Tapiz, both of which were mentioned in Karen MacNeil's Wine Bible. Every now and again even a wine blogger needs something different to imbibe. 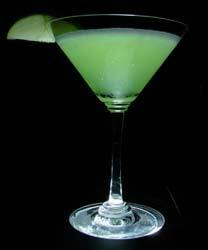 Hence, the Apple Martini. This recipe is guaranteed to turn out a perfect drink every time. Just be warned -- these drinks are STRONG! (The only mixer for the vodka is the schnapps). Pour 2 parts sour apple schnapps (I use DeKuypers Sour Apple Pucker) and 1 part good vodka (I use Skyy or Absolut) into a martini shaker filled with ice. (Don't have a shaker? Use a salad dressing cruet.) Shake vigorously, and pour into a martini glass. If desired, garnish with a cherry or a slice of Granny Smith apple. This is a perfect summer drink. Here we have another Australian wine. 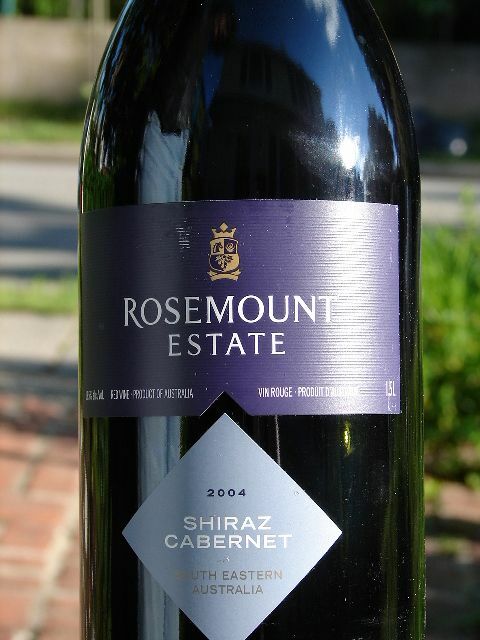 The Rosemount Estate "diamond label" is considered sort of the entry-level - the Toyota Corolla - of the Rosemount Estate wines. It's the one you are most likely to find commerically available, and the one most likely to be whipped out at your friend's next party. Should this make it less valued? I don't think so. I recently read a review of the Rosemount Estates "diamond label" wines which said "the Diamond Label range seems rather formulaic with ubiquitously ripe fruit, rich texture and the standard application of American Oak. Nevertheless, for those looking for a reliable bottle brimming with fruit and flavor, a wine from the Diamond Label range can be a good buy." 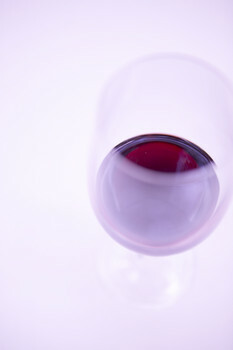 Is "formulaic" a bad thing if it produces a good wine? Again, I don't think so. We found this to be an excellent cabernet/shiraz blend, bursting with grape, plum and full berry flavors. The wine was smooth and nicely blended, and worked as well with the chips and salsa as it did with the main course. As I said in an earlier posting, I haven't yet had a bad Australian wine. While critics may find this wine "formulaic," we plain-Jane wine drinkers gave this particular wine a thumbs up. Plus, it's a best buy at under $10 a bottle. Benziger is a winery that Mark and I visited on our trip to California wine country in 2001. They take visitors on a tram tour though the vineyards, and offer a wealth of interesting info. Benziger also has one of the best, most informative web sites around. The site includes winemaker's notes, info on the current growing conditions, harvest reports, and in depth notes on each wine. Benziger practices "biodynamic farming" which is apparently the equivalent of holistic medicine -- integrating the vineyard with its surrounding environment. I like that - it's very new age. 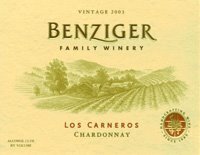 This particular Benziger wine is a 2004 Los Carneros Chardonnay. (To read the winemaker's notes for this wine, click here). The color was a very pale gold, with a bouquet of apple, wood, and freshly cut grass. The taste was crisp, Granny Smith apples. I found it to be nicely balanced and fairly dry. My parents (the Manishewitz drinkers) tried this with me. My dad didn't like it and is still waiting for me to get my hands on a bottle of Fortant Chardonnay, which for some reason is hard to find. My mom made a valiant effort to really taste this wine, and chimed in that the bouquet reminded her of moss. 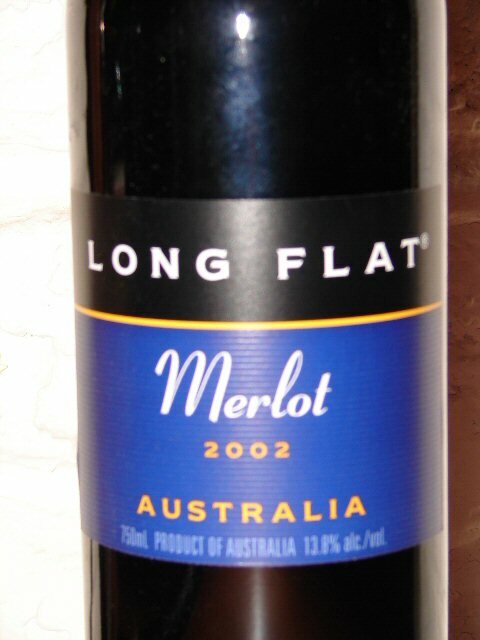 Behind this rather plain and unassuming label is a surprisingly good merlot at an extremely reasonable price. I paid a measly $5 for this wine - something which I'm almost embarassed to admit. Based on the price, and the utilitarian-looking bottle, I was prepared for an uninspired tasting. But I was wrong. 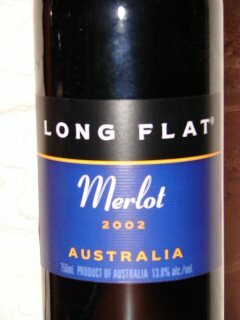 This South Eastern Australian wine was a rich dark blackish purple, with an aroma of plum, spice, and a hint of clove. It had a smooth, full plum and blackberry taste with a clean finish. Unlike some other wines I've tasted recently (notably the Mirassou Pinot Noir I rated a while back), this wine held up the next day. Because I don't (usually) finish a whole bottle of wine when I open it (without help, that is), it is important to me that the wine be able to maintain its flavor for a couple of days after being opened, without turning sour. This wine did admirably well. This is a "Grape Gal's Best Buy" pick. Worth the $5 (or even $10). Just a brief posting tonight. A local wine store (Black Tie in Port Washington) was having a "gala tasting" which I went to. It was actually quite impressive and well done. There were probably about ten different tables set up throughout the store. Each table was manned by several people and had at least 6 different sorts of wine, plus trays of cheese, olives, bread, olive oil, sandwiches, etc. When we walked into the store, we were greeted by store help who pointed out a table that had booklets describing which wines were on each table (neat idea) and a bowl of pencils so that we could write our own impressions in the booklets (VERY neat idea). The booklets were well done - each wine was described in detail, enabling us to really single out what we wanted to try. Frankly there were so many wines that I just couldn't take it in after a while. I probably stopped after about 8 tastings -- when I felt that my judgement wasn't up to snuff anymore. In my opinion, you can only really taste so many wines at one time. For me, about 8 was my limit. 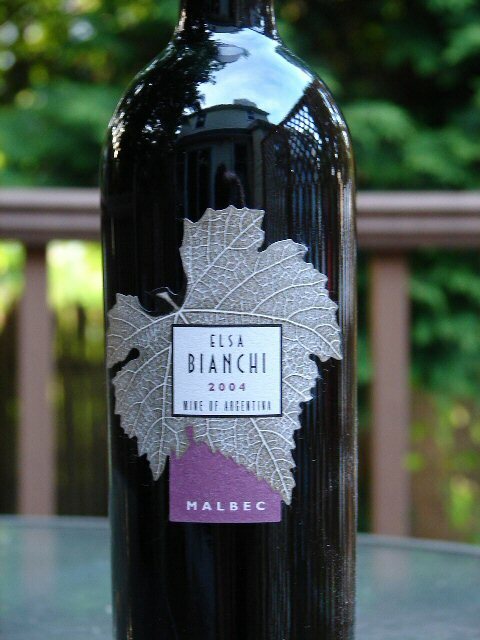 I purchased a $20 bottle of an interesting Italian wine which I'll describe in greater detail another day. It's worth noting that the tables were manned and run by the wine distributors. A clever idea in my book. The store probably paid for the food, but the distributors probably picked up the tab for the wines being tasted, plus they acted as staff. Very nicely done in my opinion. Very professional. A+. However, it appears to be yet another wine store lacking a newsletter or website. I generally prefer to taste wine in an environment when I can really just concentrate on the wine, but that can't always be the case. Today we had a wonderful family gathering in a nice Italian restaurant in Manhattan. This "cousins' club" gathering was attended by about 30 people or so, and included food, drinks and entertainment. (My dad, my uncle, my daughter, my cousin and I provided most of the entertainment). I asked for a glass of Pinot Grigio when I arrived and was pleasantly surprised by the wine, which was smooth, moderately dry, supple and light bodied. But I was really surprised when my mom (one of the Manishewitz drinkers) had a glass and commented on how much she liked it as well. I went to the bar to look at the bottle and it was a 2004 Folonari Pinot Grigio from Italy. It went especially well with the appetizer of breaded zucchini sticks with lemon juice squeezed on them. It also would be a good choice with salads and grilled chicken. It's a pleasant alternative to Chardonnay. Thank you to Phyllis & John who so generously made today's festivities possible. Much has been written about the health benefits of wine, and periodically I will provide this information (so that you can better justify your wine drinking). Today's post deals specifically with wine and HDL (aka "good") cholesterol. An article in Prevention Magazine recently reported that a 1-point rise in HDL cholesterol protects the heart at least as much as a 1-point drop in LDL ("bad") cholesterol. According to the author of a Johns Hopkins study on the subject, each will reduce your risk of fatal heart attack by 2%. Got that? 1 point increase in HDL = 2% reduction of fatal heart attack. The Prevention Magazine article goes on to describe ways to boost your HDL, and what do you think was on the list? That's right - drinking a glass of wine a day (or to be fair, any alcoholic beverage in this case) will increase your HDL by 4 points. That's the same increase as you would get from quitting smoking, and a greater increase than you'd get by losing 10 pounds, or walking briskly a couple of times a week. In fact, you'd have to lose over 25 pounds to see the same 4 point increase as you'd get from that daily glass of wine. So... which would you rather do -- drink a daily glass of wine, or quit smoking, lose weight, and exercise? Drink wine? I thought so.